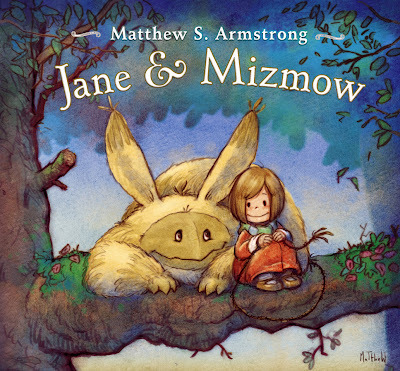 Released Oct. 11 from Harpercollins, Jane & Mizmow is LDS illustrator Matthew Armstrong's first, self-authored picture book. And just look at it -it's the cutest thing ever! The two main characters were inspired by Matthew's wife Isabel; he painted the very first Jane & Mizmow picture for her as an anniversary gift years ago (hence why the book is dedicated to her). 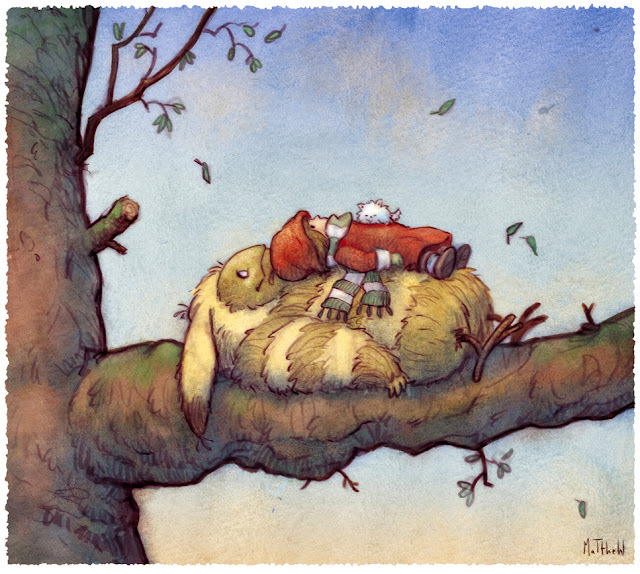 Matthew's other picture books (wherein he is the illustrator) include; The Chronicles of Narnia pop-up book (engineered by Robert Sabuda); The Return to Narnia: The Rescue of Prince Caspian; Rhino, Rhino, Sweet Potato; The Blacksmith's Gift. Matthew is also a bangarang comic artist and has contributed to the Flight Explorer series among others. Now, on with more about Jane & Mizmow -because it's so dang adorable! Just look at those pictures (below)! Jane loves to read books. Mizmow loves to eat them. Mizmow loves to climb trees. Jane would rather keep her feet on the ground. It’s not always easy being friends with a monster. But Jane’s best friend is Mizmow, and Mizmow’s best friend is Jane.